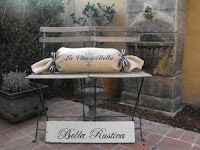 Last week a new customer, Heather, asked me if I could make a bolster pillow for her so we decided on the phrase La Vita e Bella. She wanted a little something else as well so we discussed different design options and settled on the faded fleur di lis underneath the phrase, tall and wide enough to fill up the side of the pillow that would show. Since the ink is black I decided on the monostripe black and white ribbon to complete the look. I stayed up late last night pulling it all together and completely enjoyed myself despite the late hour. 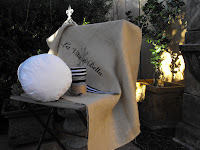 I then ended up liking the end product so much that I have decided to offer it at BellaRusticaMarket. And that is how this happens. I often have people write and express their desire to be creative and my strongest suggestion is cominciare (to begin, to commence). I take Italian lessons to learn, yes, but learning Italian is really a by-product of stretching myself and initiating on something that interests me and then respecting myself enough to keep feeding that need. Bella Rustica has been another source. Reading great books is yet another way to stay interested and interesting. Cosi, la lezione e cominciare qualcosa ti piace (So, the lesson is to begin something you like). What is it for you?